Genetic Testing, Why is it so Important ?? Due to some amazing developments in Science we now have the ability to screen our dogs prior to breeding them. I see far too many "breeders" that fail to do any testing prior because they believe their dogs are healthy, or simply don't care about the health of the puppies they produce. The problem is that 2 healthy dogs can be carriers of one or more of these genetic conditions without being affected, once bred @25% of their offspring will then be affected. Below i will try to outline the importance of genetic testing and why you should ALWAYS choose a breeder that genetically screens their breeding dogs. Most genetic defects are autosomal recessive meaning that the puppy would have to pick up a bad gene form each parent to be affected by that particular defect. What this means is that if at least one parent has tested CLEAR/NORMAL/NEGATIVE for a particular condition, any offspring they produce is UNAFFECTED BY PARENTAGE they can still be carriers depending on the test results of the other parent but they will never experience the symptoms of that disease/condition. With advancement it is possible to screen for more and more conditions. Every year or so another one or 2 tests become available so it's important for breeders to keep up to date with these. Below is a full lists of all of the testable inherited genetic conditions courtly available that affect cavoodles. Test Overview: A congenital condition in the CKCS that affects the skin, eyes and nails is the syndrome known as congenital keratoconjunctivitis sicca and ichthyosiform dermatosis (CKCSID), or more commonly referred to as “dry eye curly coat syndrome”. Reduced production of aqueous tears and tear film qualitative abnormalities result in a tacky mucoid or mucopurulent ocular discharge and ulceration of the cornea in severe cases. Persistent scale along the dorsal spine and flanks with a harsh, frizzy and alopecic coat is evident in the first few months of life, often causing the dog to scratch. Ventral abdominal skin becomes hyperpigmented and hyperkeratinised in adulthood. Degenerative Myelopathy affects both Poodles and Cavaliers therefore it can affect both first gen cavoodles and other generations. 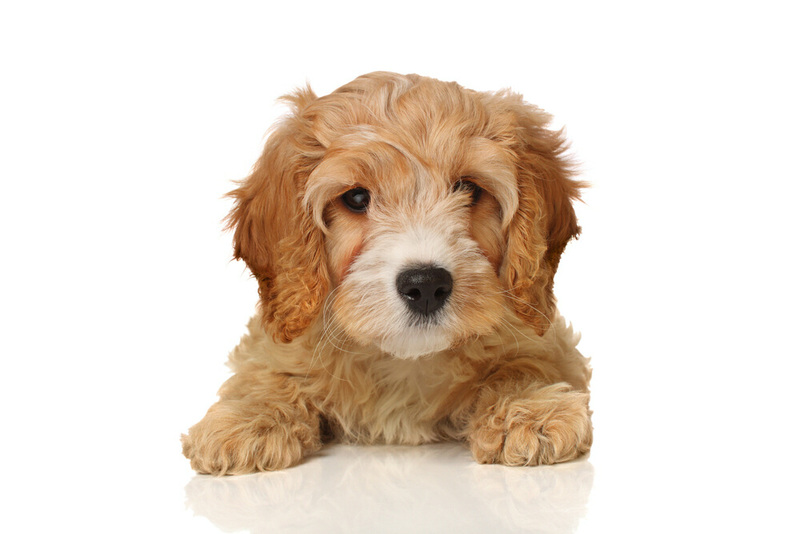 All cavoodle breeders should ensure at least one of their parents has tested clear of the puppies they breed to ensure they won't be affected by this very debilitating condition. Degenerative myelopathy is most commonly seen in the German Shepherd Dog, although other breeds are also predisposed, including the boxer, Cardigan and Pembroke Welsh Corgi, Siberian husky and the Rhodesian ridgeback. This disease is normally seen around middle age, and in general diagnosis can only be confirmed at post mortem examination. Breed surveys of some predisposed breeds indicate a fairly low occurrence rate, but most experts think this rate is actually much higher, due to the lack of post mortem follow up of the majority of suspected cases. Signs are due to the immune-mediated destruction of a part of the nerves in the spinal cord, leading to loss of these nerve fibres. The first sign is knuckling of the hind feet, and hind limb ataxia. Once the spinal cord damage progresses past this initial stage (termed proprioceptive deficits), the effectiveness (if any) of treatment is much diminished. Hence early diagnosis is vital. Following this initial stage, hind limb reflexes are affected, then weakness in the hind limbs develops, progressing to total paralysis. Once a dog shows these signs it will almost always respond poorly to therapy. Eventually destruction progresses from the middle of the spinal cord to the upper cord and brain stem, leading to forelimb weakness and eventually interference with the muscles of breathing, causing death. Most dogs are euthanased for humane reasons before this happens. Treatment is with specific supplements and drugs aimed at interfering with the immune destruction in the spinal cord, to slow further nerve damage. The effectiveness of this treatment is variable, but is only of benefit if started as early as possible. Once nerves are lost, they will not be replaced. Degenerative myelopathy cannot be cured. A DNA test is available for predisposed pure breeds to carry out screening of breeding animals. Affects Poodles and being Autosomal Dominant means that a puppy only needs to inherit one bad gene to potentially be affected therefore all generations including first gens can be affected and if either parent has poodle genetics they must have tested clear for the puppies to ensure the puppies will not be affected. Test Overview: Episodic falling syndrome (EFS) is an inherited condition affecting dogs. Episodes usually begin between 14 weeks and 4 years of age and are often associated with exercise, excitement or frustration. However, these episodes can occur at any time or under any circumstance. EFS is a disorder of the muscles that causes increased muscle tone and muscle spasticity (especially those of the limbs) resulting in limbs that appear “locked” in an extended position. This muscle spasticity results in a characteristic “praying” position and/or collapse. Episodes are usually a few seconds to several minutes in length and resolve on their own. Affected dogs appear neurologically normal between episodes. The severity and number of episodes vary over the course of the dog’s life and do not follow a specific progression pattern. This is a relatively new test and i have noticed most breeders (including registered CKC breeders) have not been testing for it. Currently about 50% of dogs tested so far are either carriers or are affected by this disease which could potentially be linked to MVD (heart disease in Cavaliers) so it's very important breeders get their testing up to date. Fortunately it only affects Cavaliers meaning that 1st gen Cavoodles won't be affected, but it will affect several generational cavoodles if not screened for prior to breeding. We have just retested many of our breeding stock to ensure we can continue to produce unaffected puppies however in rare cases this may affect some of our past bred puppies due to the inability to test before now. Affecting only poodles this condition will not affect first gen puppies, but it may affect generational litters which have poodle genetics in both parents. This very awful disease only affects poodles so first generation puppies won't be affected, however any generational litter which have poodle in both parents heritage need to be screened. With such short lifespans expected for affected puppies it's more a concern for breeders than puppy buyers though. Severity: Scale 5 is the most extreme in severity. It comprises rapidly fatal diseases that may also cause a significant decrease in the quality of life. Neonatal Encephalopathyis is an inherited neurological disease. Affected puppies are smaller than litter mates at birth, have difficulty nursing after a few days of life, and often die by 1 week of age. By 3 weeks of age, surviving puppies present with neurological symptoms including muscle weakness, tremors, inability to walk, wide-based stance and frequent falling. The disease quickly progresses to severe seizures that become non-responsive to treatment. Affected dogs typically die or are euthanised by 7 weeks of age. Pra-Pard affect both cavaliers and poodles meaning that all generations can be affected, including 1st gen, so at least one parent must have tested clear for puppies to be unaffected by this congenital defect. Test Overview: Progressive Retinal atrophy, Progressive Rod-cone degeneration (PRA-prcd) is a late onset, inherited eye disease. Pra-Prcd occurs as a result of degeneration of both rod and cone type Photoreceptor Cells of the retina, which are important for vision in dim and bright light respectively. Evidence of retinal disease in affected dogs can first be seen an Electroretinogram around 1.5 years of age for most breeds, but most affected dogs will not show signs of vision loss until 3 to 5 years of age or later. 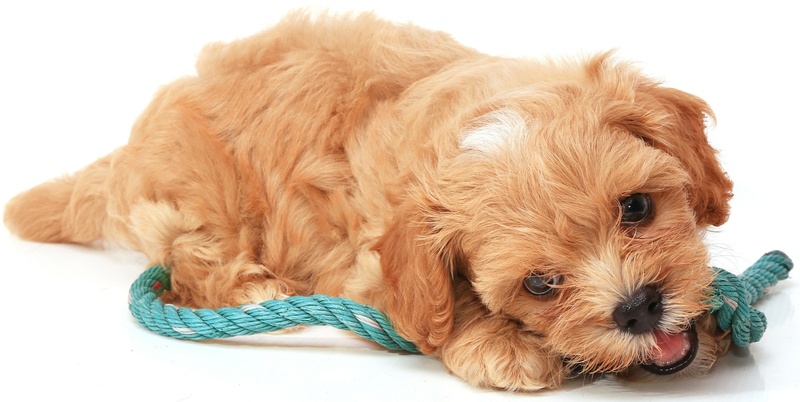 The rod type cells are affected first and affected dogs will initially have vision deficits in dim light (night blindness) and loss of peripheral vision. Over time affected dogs continue to lose night vision and begin to show visual deficits in bright light. Other signs of PRA involve changes in reflectivity and appearance of a structure behind the retina called the Tapetum that can be observed on a veterinary exam. Although there is individual breed variation in the age of onset the rate of disease progression, the disease eventually progresses to complete blindness in most dogs. Other inherited disorders of the eye can appear similar to PRA-prcd. Test Overview: Von Willebrand's disease is the most common inherited bleeding disorder in dogs and occurs when there is a lack of functional von willebrand factor. Von Willebrand factor is needed for the normal adhesion of platelets, and therefor clotting of blood. There are 3 types of Von Willebrand disease, and type 1 is the most common. This type is where an overall lack of structurally normal Von Willebrandfactor. It has been reported in over 60 breeds, as well as mixed breed dogs. Not all pups are affected equally when they have Von Willebrand's disease, as the decrease amount of von Willebrands factor can vary quite a lot. The genetic abnormality has also been described as autosomal dominant with incomplete penetrance, which leads to the high variability in expression. Different mutations have been reported. Some breeds are affected from birth, while others may not be affected until adulthood, or even middle age. DNA testing is available for all breeds however some dogs that test positive may have severe disease, while others never develop any bleeding tendancy. Other dogs are diagnosed by a von Willebrand factor assay, which expresses the level of von willebrand factor as a percentage. Levels of von Willebrand factor are less than 50% in affected animals, but animals have an increased risk of haemorrhage (i.e.. abnormal bleeding tendency) when levels are less than 25-35%. Severe bleeding tendencies are usually associated with levels less than 10-20% (depending on breed). Von Willebrand factor assays are quite variable within an individual, and can be affected by a number of factors, hence repeat testing can be necessary. Signs of von Willebran's disease are generally those of abnormal bleeding or prolonged periods of bleeding. if undiagnosed, affected dogs can suffer life-threatening haemorrhage at times of routine surgery or after traumatic event. Treatment can often be required with blood or plasma transfusions. It is generally recommended to test for this disease (or at least test bleeding times) prior to routine surgery in breeds with a high incidence of the disease and have appropriate transfusion products available in case of a bleeding episode.